With the warmer weather and longer days now here, children are out riding their bikes. There are a few easy but essential steps that kids should take after adjusting the seats and filling their tires with air to ensure a safe and fun ride. Approximately three out of four fatal bicycle crashes involve a head injury; 97% of bicyclists who die are not wearing a helmet. Wearing a helmet reduces the odds of a head injury by 50%. Simply stated, a helmet should be worn on every bicycle trip. Similar to car seats and seat belts, this should be a habit and a mandate. It is important that the helmet fits properly. Make sure it is the correct size for your child’s head and buckle the straps so they make a “V” shape right under the ear. No more than 1-2 fingers should fit under the chin strap, and make sure you have two finger widths between the helmet and the eyebrows. It is important to make sure your child is visible when riding on the road. Hills and curves on the road can obstruct drivers’ views of bike riders. If your child is older and riding at dusk or night time, they should wear bright clothing and reflective tape on their bike to increase visibility. 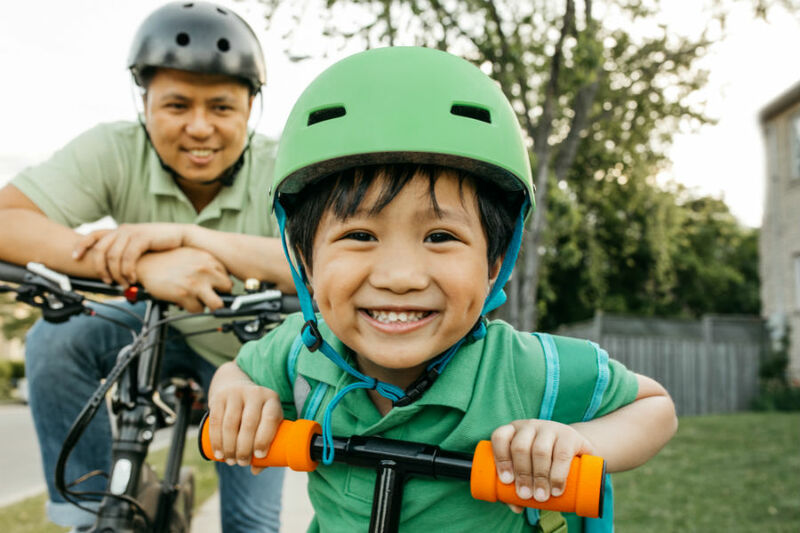 It is important that bike riders follow the rules of the road including riding in the same direction as traffic, stopping at intersections, and using hand signals. Bicyclists should never use headphones for listening to music or talking on the phone while riding a bike. Make sure to be aware of obstacles including wet road surfaces, potholes, gravel, and other bicyclists/walkers. Have fun this summer and enjoy your biking. For more information, visit our website. Dr. Mark Zonfrillo is a pediatric emergency medicine physician and injury prevention researcher at Hasbro Children’s Hospital.